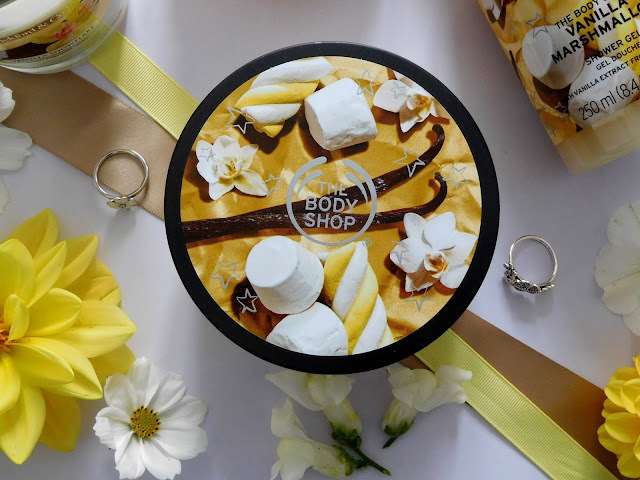 The Body Shop recently released their Enchanted Forest Christmas Collection, with a selection of gifts, which you can find here Christmas Gifts and also various body products in three new scents. The three new scents are Vanilla Marshmallow, Berry Bon Bon and Peppermint Candy Cane. In each scent they have a couple of gift sets, shower gel, body butter, body scrub, soap, hand cream, bath foam and body lotion. 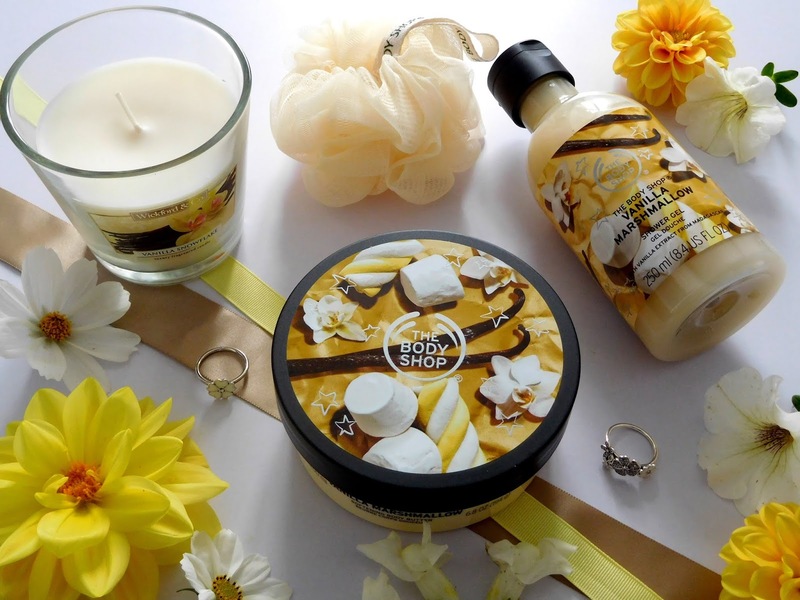 I really liked the smell of the Vanilla Marshmallow and Berry Bon Bon ranges, but just went with a couple of products from the Vanilla Marshmallow. The Vanilla Marshmallow Shower Gel is enriched with vanilla extract from Madagascar and the sweet scent of marshmallows. 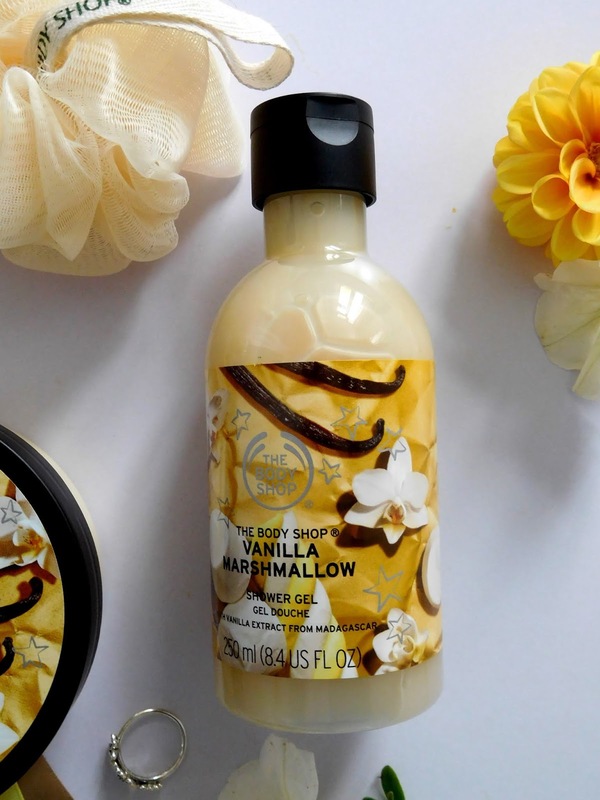 The Body Shop says it is a cleansing formula, which makes you smell indulgently warm and festive. It has a lovely thick formula, which lathers up really well. I do find with The Body Shop shower gel’s, that you don’t need a lot of product, as a small amount lathers up so much. Whilst I was using the shower gel, you could smell the sweet vanilla marshmallow aroma. When I compare this scent to the vanilla pumpkin shower gel, it is sweeter smelling. It leaves a gentle hint of the aroma on the skin afterwards. My skin felt soft and smooth after using it. The Vanilla Marshmallow Body Butter is enriched with vanilla extract from Madagascar, Community Trade shea butter from Ghana, Community Trade sesame seed oil from Nicaragua, Community Trade Brazil nut oil from Peru, Community Trade soya oil from Brazil, Community Trade organic babassu oil from Brazil, Community Trade cocoa beans from Ghana and Community Trade beeswax from Cameroon. 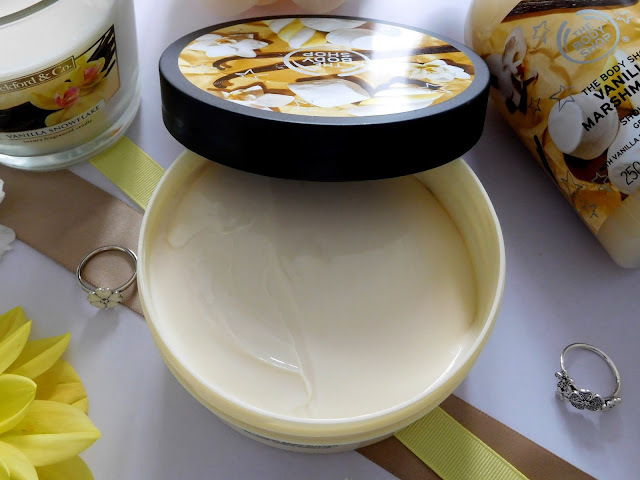 It is a sweet creamy body butter, to keep your skin moisturised for up to 24 hours, leaving it feeling soft and smoother and is ideal for dry skin. This is a lovely rich creamy formula, which massages into the skin effortlessly. With it being a thick body butter, it will take a couple of minutes to fully soak in. Once it has fully soaked into the skin, it leaves it feeling silky smooth and really nourished. Where I had some dry skin patches, like on my elbows, the skin felt so moisturised and definitely helps to reduce the dryness. 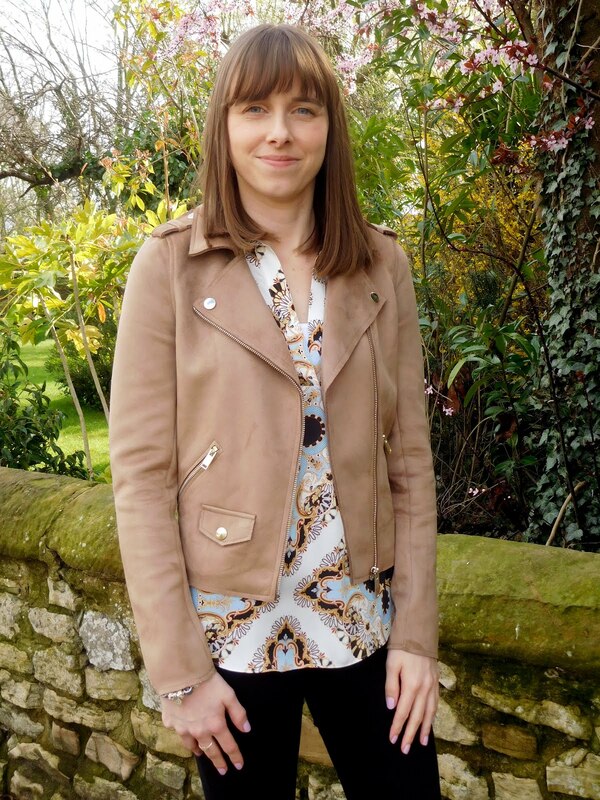 The next day my skin was still feeling really moisturised and even on my elbows where I had some dry skin. This has a more prominent smell of vanilla and doesn’t give off as sweet an aroma as the shower gel does. It is a lovely soft slightly sweet aroma, which you can smell whilst using. It leaves a lovely aroma on the skin, that’s just the right amount. When I was going to bed three hours later, I could still smell it on my skin, but the scent had slightly changed. I would say it was less sweet and had a tiny bit of a floral scent to it. I’m really loving both of these products and the beautiful sweet scent. I would definitely recommend checking out all of the new product, if you haven’t already. These are available to buy from The Body Shop UK- Vanilla Marshmallow, Berry Bon Bon and Peppermint Candy Cane. Also from The Body Shop US. Leave me a comment below. Have you bought anything from the new Christmas range? What do you think to the range?